14" Hi-HatAAX X-Celerator Hats: beloved due to their sound, made famous by the likes of Chad Smith, the drummer of the Red Hot Chili Peppers.The Hats are ideal for live and studio applications, as these perform incredibly quickly and produce crisp, clear, and defined stick sound. The specially shaped "Air Wave" bottom cymbal intensifies the chick sound - whether in the open or closed state. AAXplosion Crashes are available from 14" to 20". 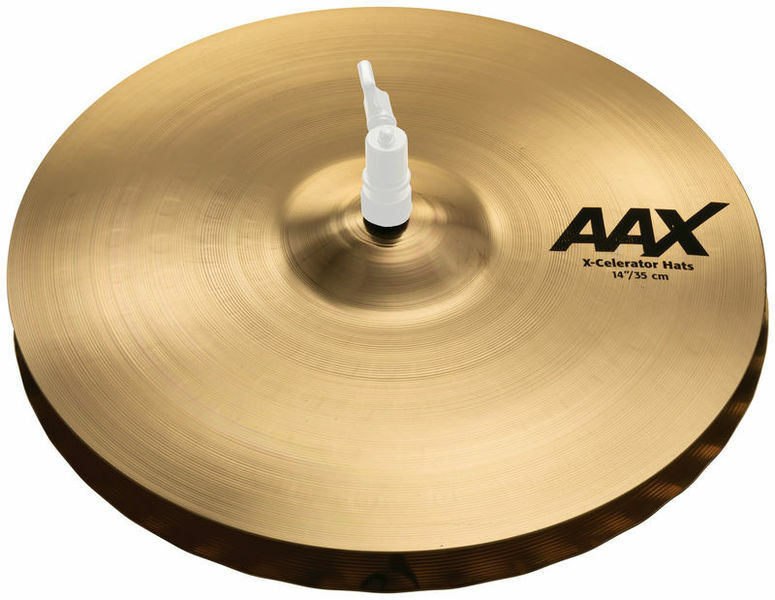 All cymbals of the AAX series are machine hammered by hand and are made of Sabian's B20 bronze. Rippled bottom cymbal for extremely loud, kicking sound. These hats are perfect for playing hard rock and metal, loud, brash and sharp! The Sabian AAAx X-Celerator Hi Hat is like I find one of the most versatile hats I know. On the one hand the bottom pool is equipped with Air Waves. Thus a corrugated basin, which allows the air to escape and so to produce a better sound. The "click" sound is second to none and very good. Also played open is the HiHat a super sound. The sound is bright as with any AAX series. ID: 188224 © 1996–2019 Thomann GmbH Thomann loves you, because you rock!